I thought these photos of the Inupiat of Alaska were spectacular, from Independent Lens in the New York Times. Through these photos I think you can 'see' the photographer Bill Hess's sentiments: "In the traditional world of the Inupiat, it is the movement of animals, birds, fish, wind and current that sets the agenda. Not the clock." Perhaps a world in harmony with nature, working with its natural rhythms, not against them, would be a world in balance, and in peace. To view the complete portfolio, click here. Bill Hess Jonathan Aiken’s crew watches another boat pursue a bowhead. Bill Hess Bryan and Bruce Nukapigak with a silver salmon from their net. Raised as a Mormon in Utah, Mr. Hess felt a powerful, mystical attraction to Alaska and Native American culture even as a boy. He read and reread the poetry of Robert W. Service (“There are strange things done in the midnight sun”) and took on the nickname Kodiak. Called to service as a missionary, Mr. Hess asked to serve at the Cheyenne River Indian Reservation and Crow Creek Sioux Reservation in South Dakota and at the Fort Peck Indian Reservation in Montana. He was enthralled by the beauty of the culture and deeply disturbed by the hardships the people faced. During this time, he met Marjorie Roosevelt, a White Mountain Apache who was also on a Mormon mission. They later married, when they were students at Brigham Young University. They have five children. After moving to Alaska 30 years ago, he freelanced for two Anchorage newspapers and later wrote and photographed for The Tundra Times, a statewide newspaper for and about native peoples. As Mr. Hess covered the Inupiat, he slowly learned their ways. “I recognize there are times not to ask questions but to just be quiet and observe,” he said, “and the answers will present themselves to you.” “In the traditional world of the Inupiat,” Mr. Hess added, “it is the movement of animals, birds, fish, wind and current that sets the agenda. Not the clock.“ As his relationship with the Inupiat solidified, he published a quarterly magazine, Uiniq, from 1985 to 1996. It was distributed around the 89,000-square-mile North Slope Borough. 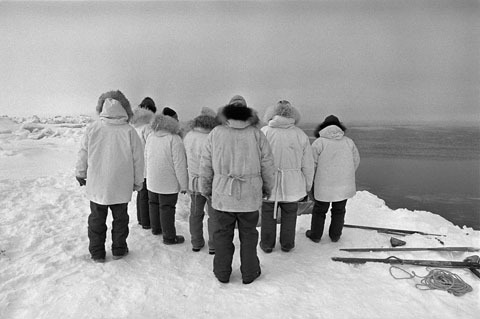 He also wrote and photographed the book “Gift of the Whale: The Inupiat Bowhead Hunt, A Sacred Tradition” (1999), and the Web gallery, “Inupiat Bowhead Whale Hunt.” In the book and the magazine, he documented the Inupiat fight to preserve the traditional bowhead whale hunt, without restrictions. “Now they have turned their attention to a new, internal battle,” Mr. Hess said, “the battle to reverse and undo the damage brought to their community by alcohol and drug abuse.”While trying to help the Inupiat, Mr. Hess finds himself in a position most anyone in Alaska — or the Lower 48 — would envy: living the life he dreamed of as a child.